On Saturday, April 21, 2018, Boca Raton will host Comic Cure's "Florida’s Funniest Female" competition at the Mizner Park Comedy Club. This annual comedic showdown, now in its third year, showcases female comedians from across the state of Florida as they go head to head for the coveted title of “Florida’s Funniest Female.” With fifteen of Florida’s top female comedians taking the stage this year, each hoping they have what it takes to be crowned the funniest of the bunch, you can bet that this year’s competition will deliver some of the best, knee-slapping stand-up comedy around. The show will begin at 8:00 pm, but it is recommended that attendees arrive 45-60 minutes prior to the start of the event. You must be 18+ years of age to attend, with General Admission on a first come, first served seating basis. Tickets can be purchased over the phone by calling (786) 564-2291. Ticket prices are $20 for General Admission, $25 for Reserved Seating, and $30 for VIP Reserved Seating. Beer, wine, soft drinks, as well as light snacks & candy will be available for purchase, but attendees are encouraged to dine prior to the show at one of the many amazing dining options available in Mizner Park & Downtown Boca Raton. The Mizner Park Comedy Club is located at 201 Plaza Real, Boca Raton, FL 33432. Nearby street, lot, and garage parking will be available at the regularly displayed rates, however, parking around Mizner Park is typically at a premium and very limited. Ride share services, such as Uber, Lyft, or the Downtowner, are highly recommended for those who would prefer to avoid the hassle of finding parking before the event. For more information about the event please visit FloridasFunniestFemale.com. If you are a fan of stand-up comedy or just find yourself in need of a good laugh, be sure to call and purchase your tickets and mark your calendar for this side-splitting comedic event that promises not to disappoint. 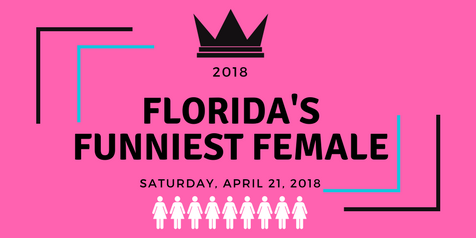 We look forward to seeing you there on Saturday, April 21st, 2018, when we all finally find out who is "Florida's Funniest Female!"